I had a GREAT birthday weekend! It started with dinner at Lupe Tortilla with some wonderful friends on Friday after work. While we were there, I realized we've been having my birthday celebration here with the same group of friends for the last five years! 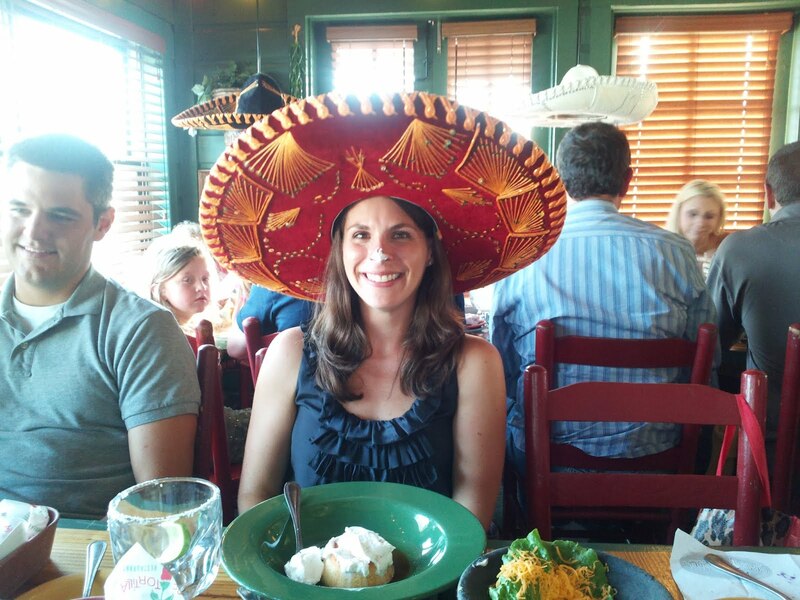 Jackson and Audrey loved it because our favorite waiter gathered his friends, put the big, red hat on my head, and stuck a spoonful of whipped cream on my nose while singing happy birthday to me! Saturday, we managed to dodge the rain and spent the morning at the beach in Galveston with Emma and Clara. 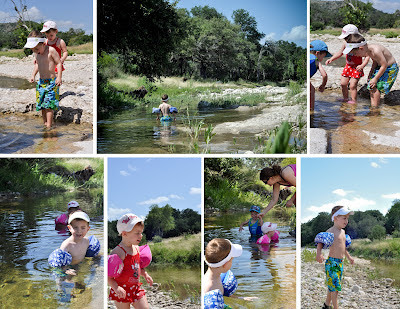 The kiddos played hard and took a great, long nap that afternoon, which caused us to change our plans for the evening. We ended up having a nice quiet evening at home with a home-cooked meal and a more traditional birthday cake. Then on my actual birthday on Sunday, I got to sleep in a little later than usual, but was eventually woken by the kids who were too excited to wait. They'd made special cards for me and wanted to show them to me and tell me all about them! They'd both drawn their own versions of me and either stamped or written their birthday wishes and names. There were also a pair of googly eyes on both cards. Neither pair were part of any particular drawing, so I'm still not sure what that meant...nevertheless, they were precious to me! The rest of the morning was a whirlwind of birthday pancakes and getting ready for church. We enjoyed a family-oriented church service with Jackson done "Gateway Style" while Audrey enjoyed her regular Sunday school class. It was a lot of fun to watch Jackson sing and dance and worship in his own way and to show him how we worship too. 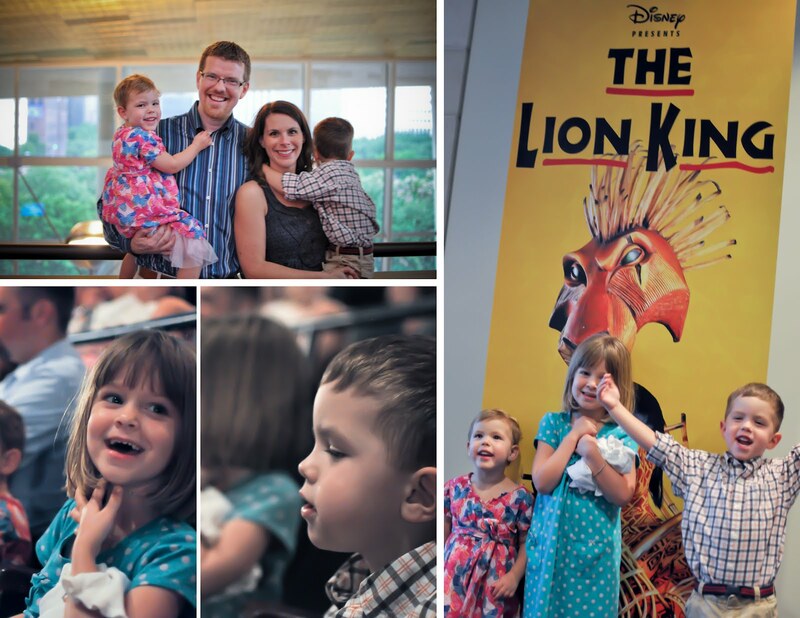 From there we headed to lunch with the Fulliloves before making our way to the Houston Hobby Center to watch The Lion King! The kiddos powered through with no nap and behaved amazingly well. 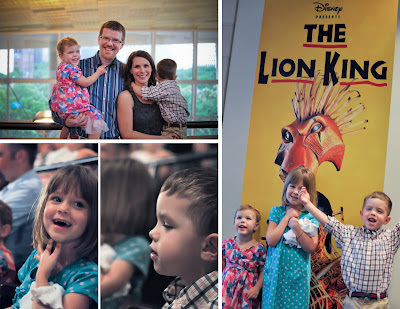 They were totally awed by the performance, as were the adults! The costumes and performance were truly amazing! We rounded out the weekend with a delicious meal and dessert at Cullen's, which made for no less than three different birthday desserts! Then I was greeted by yet another b-day dessert at work today...I love celebrating birthdays! For the last several years, we have celebrated the 4th of July in Leakey with Ross' family. This year was no exception, although it was a little different. Because Ross recently started a new job and didn't have any vacation time, he wasn't able to join us. That means I loaded up the kiddos, and we made the ~6 hour drive without him. I was a little worried I would be listening to crying and fighting the whole way there, but to my surprise the kiddos did GREAT with a few well timed stops to stretch their legs and play at either a McDonald's or a rest area with a park. The trip was off to a great start! Our first full day there was the 4th of July, and one of the kiddos favorite activities of the day was playing in the back of a trailer! 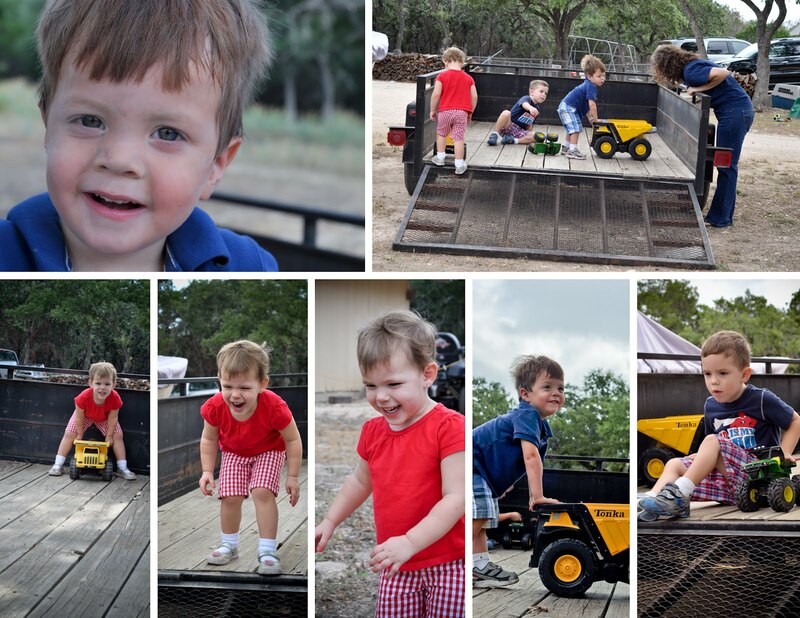 They each found a truck and repeatedly rolled it down the ramp hoping it would flip or do something funny. 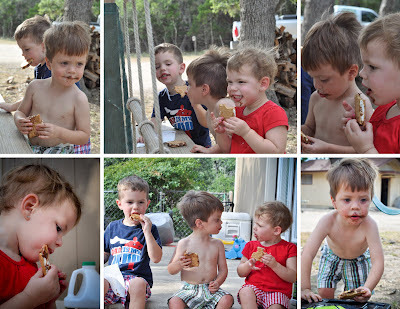 After a little swimming and dinner that night, we all enjoyed some smores! The next evening, we made our way to Garner State Park for a hayride. It was narrated by a very interesting woman from Leslie and Philip's church who has visited or lived in the area for over 60 years. She had some great stories to share. 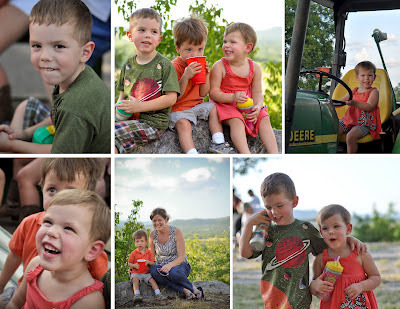 The kiddos were a little tired since it started around their bedtime, but the stop at a beautiful lookout point for some lemonade made up for it! On Friday we made our way to the ranch for a Polaris ride. 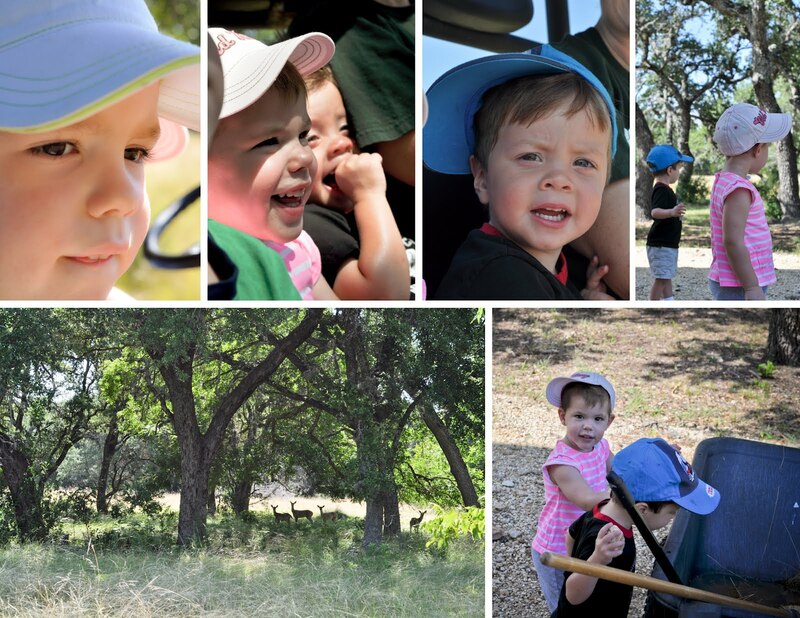 Jackson, Audrey, and Mitchell all loved the wind in their hair and the bumps that made them bounce, but they were even more excited to discover a group of deer resting in a group of trees. When the ride was over, everyone quickly changed into their swimsuits and headed to the Little Dry Frio river for a swim. It was a little chilly but felt great on a hot summer day! Saturday was the Leakey 4th of July parade, which we got to be part of this year. We helped decorate Philip's truck with signs for both of their companies along with flags, beads, and other fun decorations the night before. Then we loaded up early that morning and got in line for the parade. While we were waiting for the parade to start, we walked around and found a friend, Tow-Mater! 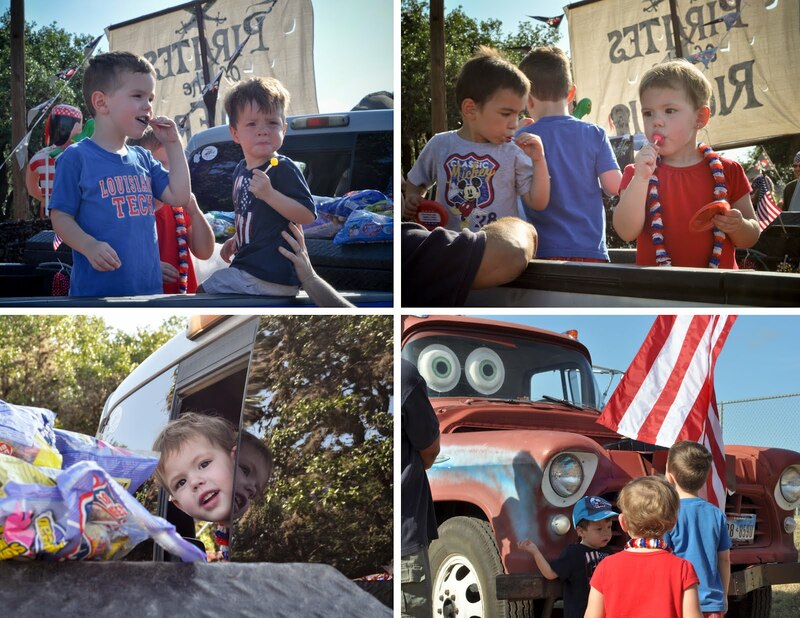 Once the parade got started, the kiddos had fun throwing beads, candy, and frisbees to the folks lining the streets. When the parade ended, we grabbed some lunch and headed home to see Ross! Jackson and Audrey did great on the ride home as well. I was so thankful for the time with them, Leslie, Philip, and Mitchell. It was a great 4th of July, but I look forward to next year when Ross can join us too! There are more pictures of the fun in the album.